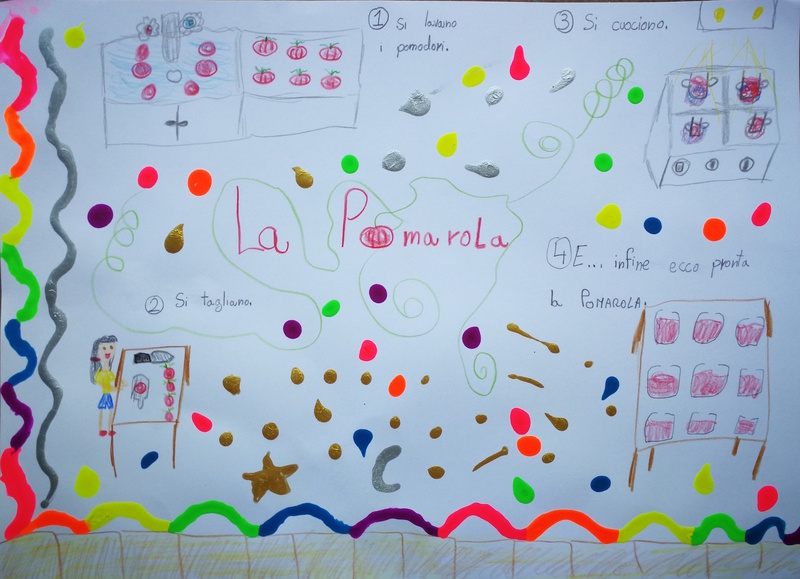 Pomarola was always a big event in Raffaele’s family. 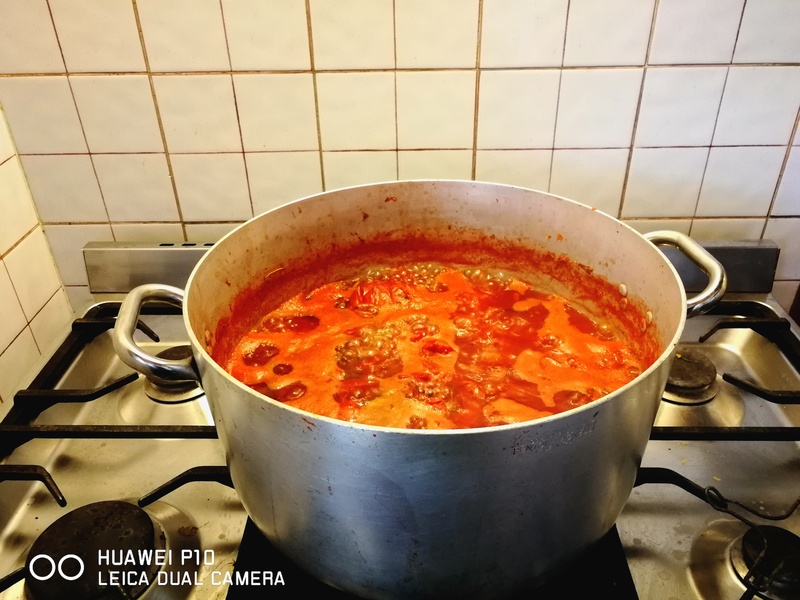 His mother Maria-Laura, the nannies, relatives and friends (generally only women 🙂 ) got together in the month of August to prepare this Tuscan traditional tomato sauce. There is of course a basic recipe but all families decide to add a bit of their own personal tastes so you will never find one jar similar to another. The second step is to clean and chop the tomatoes. This is when the fun begins. 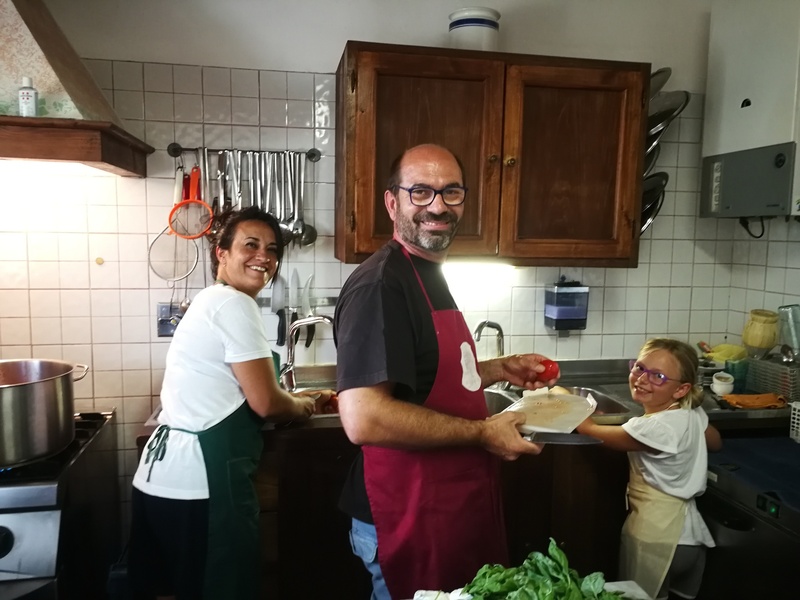 Raffaele, our 7 years’ old Adriana and our friend Teresa in action. Besides the tomatoes we also add the odori (the so-called “scented” vegetables: onions, carrots, celery) and at the very end basil (lots of basil). The amount of “extras” added to the tomato sauce defines the difference from one family recipe to another. 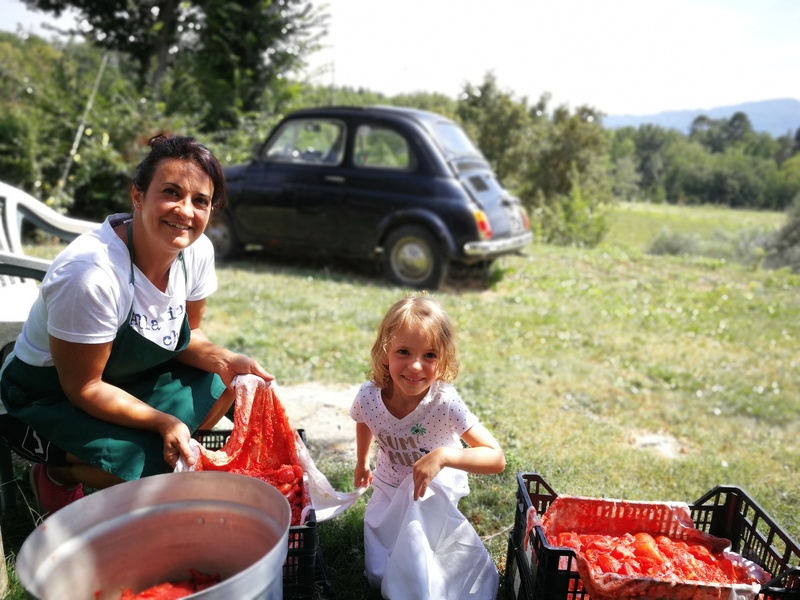 Once all tomatoes are cut in pieces, they boil in sugo proprio for about 30 minutes (you just put them in a huge aluminium pot without adding anything). This is the third step – fundamental to extract the water out these red treasures. Children love this moment because they finally get red dots on their aprons and T-shirts. In the meanwhile, the odori are cut – some prefer to chop them in bigger pieces, we decided to cut them finely. Step four begins as the “scented” veggies are added to the tomatoes and cooked together for about an hour. This is probably the longest phase of the making of the pomarola. 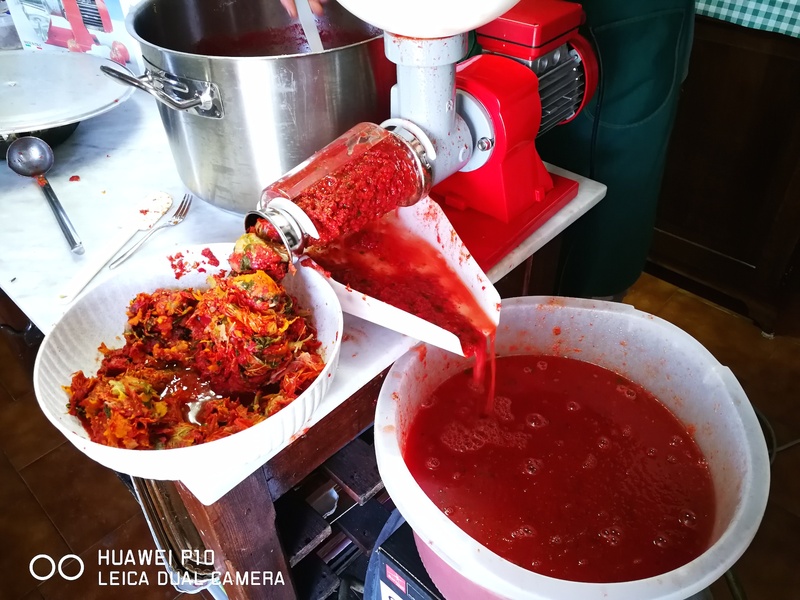 Once we cool down a bit the pomarola, with the help of modern technology (electrical passapomodoro), we refine the sauce. The refined pulp of tomatoes and veggies makes the final pomarola. In order to preserve the pomarola for the coming weeks and month, we put it in beautiful Bormioli Rocco Quattro Stagioni jars and boil them for 45 minutes to create a perfect vacuum. Let jars cool down in the same water where you boiled them. Lots of colourful splashes while making the pomarola. 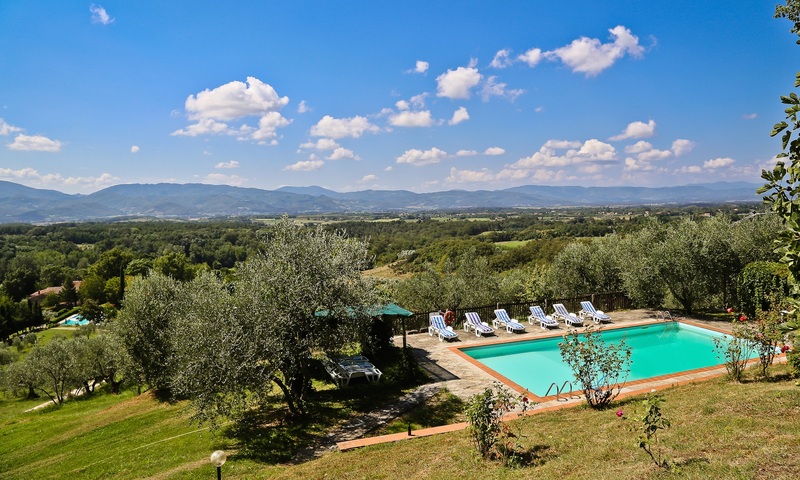 The only decision you have to take now is to come over the our agritursimo in Mugello Tuscany and taste it for yourself!